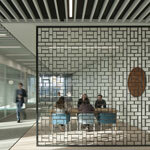 This category awards a space, or spaces, within a building that demonstrates a high quality of interior fit-out. 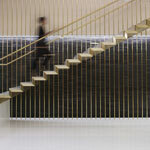 Estée Lauder compacted five London offices into this single new central Headquarters building. This fit out was more than cosmetic, it achieved the impressive feat of moulding the 25 brands into one corporate workplace whilst retaining their individual identity. The new headquarters is centred around family, home and community to support collaboration, agility, creativity and innovation. The open and flexible environment the team has created will also help the beauty products giant attract and retain talent. Visitors will be made up from the moment they enter the building and are met by the sophisticated reception in the style of a contemporary boutique hotel lobby creating the Estée Lauder backdrop against which the brands can express themselves. 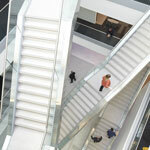 The spectacle continues through to the dramatic central atrium and the statement internal suspended spiral staircase which provides an eye-catching connection to ground, first and second floors and gives access to the cafes, social space and shop. Health and wellbeing facilities are at lower ground whilst the top floor houses presentation areas, the bar and event space. Staff benefit from an in-office salon and private make-up shop. Set over the 10 floors, each of the individual brands shine through and project their own identity within the business with their bespoke ‘brand hubs’ giving each ‘a range of free expression’. The modern technology utilised, which allows key areas to be rebranded at the touch of a button, is most impressive. The office floors offer healthy levels of natural daylight and can be adapted to suit different working patterns as required. The agile workplaces encourage collaboration and have improved levels of productivity. It its clear the close collaboration between the designers and client was instrumental in applying the foundation for this successful outcome, with the beneficiaries being the users and visitors to the building. This inspirational, open and flexible workplace is ideally suited for the Estée Lauder family and will help the business to innovate and collaborate. 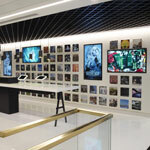 The success with which the team have provided one home for the various companies, which still allows them to showcase their separate identities, together with the clever use of technology to re-brand flexible spaces is exemplary. Touches like the cafe juke box, illuminated atrium and viewing areas ensure this office has a wonderfully animated atmosphere. The building’s irregular layout has been used creatively to make varied and engaging spaces that cater for a range of activities and working styles. 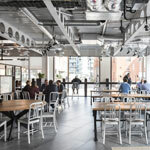 The judges loved the invigorating and inspiring atmosphere of the wining Fit Out and were impressed by how perfectly the workspace responds to all the needs of the business. Teams previously split over two locations have been brought together in this stimulating and thoughtful environment, which is enlivened with local artist’s work. The open-plan workspace creates multi-function break out areas that could be utilised as desking in the future. KPMG Glasgow is an outstanding fit out which delivers consistently high standards throughout, which the judges felt reflected perfectly the values of the occupier and the needs of its staff and clients. Now housed in Fitzrovia’s One Fitzroy place, the judges highlighted that the fit out of The Estée Lauder Companies building unites over 25 brands whilst retaining their identity in an open and flexible environment designed to attract and retain talent. Set over 10 floors, all the individual brands shine and have their own identity within the business, yet technology also allows key areas to be rebranded at the touch of a button, the judges added. The judges also congratulated the architects at MCM for creating an inspiring workplace ideally suited for the Estee Lauder family and helping the business to innovate and collaborate. The judges agreed that the ‘workspace lab’ for Energy Systems Catapult is a collaborative and creative space which both encourages collaboration with the wider industry and provides a centre for debates, conferences and cultivation of ideas. 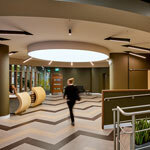 They were impressed that the company ethos to stimulate innovation in energy technologies is defined throughout the design of the fit-out and makes a dynamic statement to attract talent and leading academics. 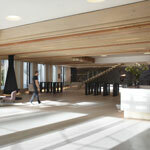 From a design perspective, the judges noted that the careful use of ‘earth tone’ colours found in the city and crisp detailed timber surfaces brings a warm, calm environment that ripples out from the central welcome space. The BCO judging panel highlighted that Maersk’s decision to create a new home for their IT team in The Point at the centre of Maidenhead has paid off, creating a vibrant office where agile working has been fully embraced. The judges praised the use of high quality natural materials, together with an understated palette of colours that reflect company branding throughout to achieve a subtle Nordic feel. The team have utilised the base build well, the judges noted, opening up the views to the countryside from the point (which gives the building its name) to all, not just the favoured few, and resisting the temptation to change too much of the original Cat A fitout.